⇒ [O] Can I Borrow An Eraser? [OPEN] Can I Borrow An Eraser? Well he had really screwed that up. The golden rarely forgot anything. He remembered every name, and every face, but this time something had slide by. Worse of all it was actually something rather important. The golden’s little pet project of Rohan had lain gathering dust in the blurred days after the invasion. The time for showing it, and revealing himself always a member of the Falls might be slipping by. Time was precious. So here he was. From the Rotunda he slips and in the darkness of early dawn he lets eased his golden body through the painful process. Even now his nerves still stung with the tingling after effects, and his anger still caused those black feathers by his sides to ruffle. Of course what he had found upon leaving the Rotunda had calmed him a little. Behind the pillars of stone, tossed as if from one of the windows was a blue piece of fabric. Silver wove in with the rich dark blue to give it a most beautiful glimmer in the sun. Most pleased with this find he slipped it on, and found a pocket on either side, bringing a grin to face for the first time since he had remembered his blunder. The cloak did not have wing slot though, but that was easily remedied with his dagger. And now, jogging through the meadow was the lovely dark bay Rohan, dressed in a fine blue cloak. Rohan though didn’t include a pet deer. Much to the golden’s annoyance. The companion was a dead giveaway though. So in a thick wood the blue banded had stopped and in the tongue of his ancestors explained. Haldir was not as easily persuaded as before. His little hoof had stomped in the fallen leaves, bleating out his anger. It wasn’t exactly a peaceful scene after that unfortunately, and the deer bore a small cut on his shoulder for it. After the jostle the gold took more care, and the two parted ways without bitterness. Haldir, bearing the golden’s gold cloak jogged back north quick as he could, to avoid the eye of predators. The gold had watched him go for a little bit. Hidden of course from the deer’s sight. Thinking him safe he moved on, and headed south at a quick jog, the cloak flapping at his heels. He was a Pegasus though, and aren’t they supposed to fly? The bay slowed at a creek, and mind mulled over the new thought. Well that wouldn’t work well. He needed an alibi, a story. If someone were to recognize him where would he say he had been. Snorting, and looking to the mid day sun the blue banded turns and heads to the cooler shade of a tree hanging over the creek. Mind a flurry of ideas and plots. Mostly it ran through the tapes of who knew Rohan, and how the bay was supposed to act. Shaking his uncrowned head the bay bird lowered his lips to the creek water. If only there was someone about. Someone he could use to ease back into this before heading to the Falls. Head rises to look about. Who would come out and volunteer to be the test monkey during this refresher course? Mesec was late for his patrol, very late. The change in the seasons was not as noticeable, he found, in the Throat - Orangemoon was slightly less scorching hot than Tallsun but would there even be a chill in the air when Frostfall came around? He had not even realized how late into Orangemoon it was until he started travelling further north, the colours in the trees and the temperature of the winds that he soared through let him know just how late he was. The season was almost over and there was much that Mesec still had to do. Hadn’t he told himself that he would do whatever he could to be helpful to his new herd? The tasks that he had to do were simple and he hadn’t gotten around to accomplish them yet. This guilt was a new one, though it found a happy home among the others that lived in his mind constantly. Thankfully, there was time, but on his flight across Helovia he needed a break. Thirst burned in his throat and he circled back over top of the Thistle Meadow before descending. I follow the stars until the first light. The cool water washed over the tense golden and eased him for a moment. He chilled him, literally. That’s right, Rohan was supposed to be cool headed. No hot racing blood around here. What was that history he had built around him again? Oh yeah, an old soldier. Tired of battle. Which meant no jumps or races. A calm creature of a gentle ease. He made you feel at ease. Like he knew the horrors of the world, and how to shelter you from them. Like he understood. Yeah that was it. As the blue banded drank his mind revolved around his pet project, flowing faster than the creek. It had been unfortunate for it to be interrupted so soon, and far more difficult than he thought to hold a double life. The skill was there, but lately the time had not been. A rustling can barely be heard over the creek below him. Feathers, still not in his complete powers, vibrate. Their murmur though at last gives him reason to raise his head. Those sea blue eyes leading, pulled his uncrowned head over and up slowly, but in readiness. The golden carefully crafted each move. With a minor thought he wonders if he did so too much, but there was little time for that. Coming to his full height the blue banded lets a small smile play on his lips. Not really for a warm greeting but for the one the hidden golden sees as a perfect target. It was a Pegasus for starters, dark with a hallowed white trimming. A nice looking little bird with a pleasant mind to him. Not aggressive, not scared. It would be a lovely little test. Uncrowned head dips a little, and white banded wings open slightly in greeting. “Hello.” It was a warm rumble of a tone. The golden rather liked it, though perhaps it rumbled too much, he might edit that a bit next time. The generous blue banded then lowers his head in an offer, and a more relaxed frame. “Would be a pleasure.” His body recedes from the water’s edge, seemingly done with his drink, or perhaps still unsure. In honestly the golden underneath was always watching. Who was this who stepped up to the plate? How fast could the golden wrap around him. The white banded wings tuck back close, seeming to draw near in a relaxed comfort as he wait to see if the other will drink. Dark tassels waver over those sea blue eyes as they look off for a moment, seeming to take in what was around them before coming back. Blue cloak rustling slightly in the small warm breeze. “It is a warm day for autumn.” Was he really going to talk about the weather? Shitz he was losing his touch. But without his usual objectives driving the show, he didn’t know what else to really grab hold of. “Oh, apologies, I am Rohan.” The blue banded turns more fully to him and gives a small nod. The apology simply a transition in the awkward moments of this conversation. Surely it would get a little better, or was he really this out of touch? Not to mention the identity of this new creature was very much a desired topic. Mesec dipped his own head in response to that which the brown stranger gave, his black mane falling around the twisted horn as he followed through the movement. The gesture seemed to him to be a nice way to show his appreciation for the acceptance. It would have been easy to move off and find another part of the stream to drink from, if the other had no wish for company, but the demigod was glad that he had not been turned away. Company was a welcome distraction lately. He was fighting against his nature - trying so hard to not be the lone wolf any longer. He wanted to be the type that fit in with the crowd, that had a place in a herd and a family. He wanted to be the type that could strike up a conversation with a random stranger he happened upon in the Meadow and he did not see any reason why he could not be that type. 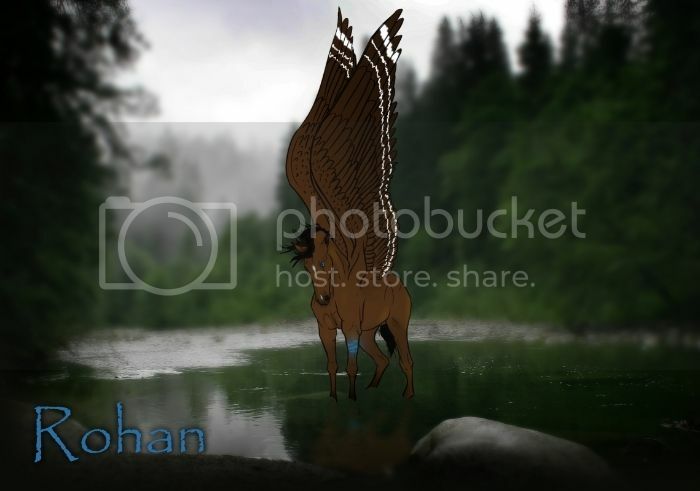 The brown pegasus stepped back from the stream as Mesec stepped forward, his head going down to the cool water greedily as he quenched his thirst. Satiated, Mesec stepped back as the last droplets fell from his black face and he looked to other, noticing the blue cloak as he focused on his company more completely. He wondered whether it ever got in the way when he was flying but - there was another topic that was brought up that saved Mesec from asking such an embarrassing question. “Yes, it is. And so close to Frostfall, I wonder if we’ll have an easy cold even with the Moon Goddess gone.” He was almost impressed with himself, casually bringing up his mother in conversation without stuttering or flinching away at the mention. The weather of Helovia was so innately tied to the presence of the Gods that he wondered how they would continue to be affected by his mother’s absence. Would Frostfall be kind or harsh to them without the Moon? “No apologies needed. My name is Mesec. It’s nice to meet you, Rohan.” Now that the topic of weather had already been covered, Mesec found himself in the position of having to come up with something else to say. Anything would do - except maybe the cloak question. Better to wait and see the temperament of Rohan, though he seemed well-mannered enough so far. Alright so that left him with… what? Not wanting to delay continuing the conversation for two long, the silver-lined stallion blurted out the first question that he could think of. “Do you live around here?” Mesec had not seen him around the Throat but that did not necessarily mean they weren’t from the same herd - every once in a while he still ran into someone new he had never met before. He had not thought the herd to be so big but he was finding that any preconceived notions he had about the island herd were pretty much all wrong. Look at how polite they could both be. Mesec there talking so rationally of his mother, and the golden, being pleasant and apologizing. Perhaps they were both playing different identities. Of course these were not in the golden’s thoughts. He was thinking more of who this creature was, how could he destroy them, the usual things. Right, perhaps that last one did not fit in with Rohan. Full tasseled tail swishes behind him, as he struggles to find the balance between what he seeks and what Rohan might. Why he had to make a personality so largely different from himself he did not know. Smiling the blue banded nods at the others words. It brought up and interesting topic, did Rohan know about the moon goddess? Certainly the golden did, he was there! But Rohan…he had arrived after, hadn’t he? Certainly he hadn’t been present, for obvious reasons. So would he know to speak her name in hushed tones? Or fear her appearance? The golden then adds a pensive look into the mix of reactions. Perhaps he could correct that need now. Not to mention it seemed that the answer to the question ‘What did she do?’ was a grand judge of character. Of course there were more civil things to discuss first. Like names. The bay’s smile grows as the other greets him so warmly. After all for several weeks now he had wandered as an outcast. There not many warm smiles afford to them. Not to mention what it signaled about this creature. Many were distrusting and guarded everything they had, even their name, closely, but this stallion seemed at ease, that perhaps gave the bay’s smile its sincerity. Before the bay could bring the conversation back to the moon goddess, the white splashed creature provided an opening all its own. When he poses the question of where the blue banded lives, the creature’s face falls slightly, and he looks to the babbling creek. His ears have fallen slightly and shoulders sag. Was he ashamed? “I did…I had just joined the Falls before the invasion. Though I hope to head back.” He seems once more to remember his manners. “And you? Where from do you travel from on such a warm day?” It was a failed attempt to distract himself. After the creature’s answer the conversation turns back. He seemed to unsure, but proceeded. “I have to ask, for you seem so at ease here. What spurred them to attack? Whispers reach me of the Moon Goddess, but always they do so hushed and end quickly. You spoke of her so boldly, …I-I was wondering if you knew?” All the while he babbles the blue banded’s wings lift and shift. A much more conscious effort than others might think. Now though he could see just where this creature stands, and perhaps learn more about him? This was turning into quite a delightful conversation, and the golden hidden within was smiling like a witch over her brew, stirring the pot to see what colors it turns. Mesec did not think that there was anyone left in the corners of Helovia that had not heard the rumours, truthful or not, that surrounded the invasion that had occurred. Even in the Throat, isolated from it as they were, they had been notified. I know better than most. The thoughts flickered through Mesec’s mind as a small frown registered on his face, but he was glad that they had not been formed aloud. Rohan seemed friendly enough, but it was not often that the silver-lined stallion cast about his lineage so casually into conversation. Would that ever change? Was there a day when he would stop shying away from the attention, good or bad, that his demigod status generally gained him. He thought about what seemed to be general information, beyond what he had been told and what he thought he knew. When he found his voice again, it was low - correcting for what Rohan had called his ‘boldness’ just moments ago. “Moon Goddess had bewitched someone to commit murders, bodies were scattered across Helovia. Young and old.” He knew that, at least, for sure. He had seen the bodies, remembered that some were so young. It was for them that he had issues believing in her justice. But, if his lineage wasn’t a topic for casual conversation, the intense conflict that his love for that dark goddess caused him certainly was not either. He did not attempt to hide the pain that the topic caused him - he grieved for them all, though he knew none. “She was outcasted by her brothers to the Edge and those that lived there, they were unhappy with the idea of the Goddess staying in their herd.” He wondered if she had even made an appearance. And, not for the first time, he considered visiting her. But he shrugged off the thought with a shuffle of his wings. “Not the greatest reason for an invasion, I’m sure, but you can’t really blame them.” Mesec hadn’t when he heard the news, and still could not find any reason to disagree with their course of action. It all seems so gentle and tranquil. Like as if this was a normal meeting in Helovia. Creatures meeting discussing topics of the day at the water cooler. The thought is almost humorous. This was far from ‘normal’. This was in fact, highly unusual. Which is sad really, because this certainly was more fun than most might give credit. The golden for one, hidden behind those sea blue eyes were truly enjoying himself. Well not because the pleasantries really. The whole wish you peace stuff was actually rather boring, but the smile and mention of the Throat was very interesting. A spark is hidden as the bay bird adds in a smooth tongue. But of course that wasn’t the most interesting piece up for discussion. His question on the moon goddess was what really intrigued the blue banded. It was in the end rather ironic. The golden had not the slightest clue of Mesec’s heritage. If he had this might have made it even more interesting! Still, it was enough to keep the golden occupied, and his acting skills on point. The bay creature grows slightly more serious as the Nightwind speaks. The mention of murders and young and old draw hard and cold gazes from his eyes as he turns to look out over the water. He listens to all the tale, silent and thoughtful before speaking. “We of the earth are evil enough to kill in cruelty, but I never thought a mighty God would call upon the same darkness.” Shaking his head he sighs letting out the trails of old wounds. He doesn’t pause long before going on, picking his low defeated tone back up. “No, I suppose not. Strange to be so cowardly, and brave in the same moment.” He exhales an almost laugh. Yes Rohan would find that humorous to not stand up and be completely brave. After all, he held such a strong inner being as to think that impossible. Of course he of all knew bravery to be difficult to define. It can be achieved in many ways, some better than others. Looking to Mesec the bay seems pensive, but the sweetness still left lingering. “Thank you. It helps to know what family I’m returning to.” He lets a warm smile come over him again. Right so now what? Well, honestly he didn’t have much. Mesec may be of the Throat but he was new, so what could he know that the golden didn’t already. Shaking his black mane and pulling back his feathers to his sides he stands straighter, seeming to gather himself. “I feel I must be off to make it there by sunset, yet it was wonderful speaking to you Mesec.” He seems to genuine, with his smile and head outstretched in friendship. “I hope to see you again, perhaps in light of better conversations.” Or in different colors. OOC ::You can post again, or end it here with them walking/flying off. Let me know!